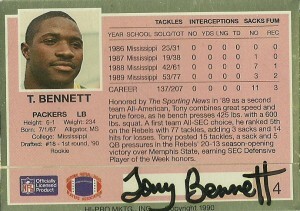 A brutal hitter with good speed and excellent pass rusher- Tony Bennett was taken in the 1990 draft by the Green Bay Packers in the first round. (In retrospect the 1990 draft was a great linebacking class, led by Junior Seau, Chris Singleton, and James Francis.) Bennett would be the 6th linebacker taken in the top 18. The knock on Alligator Bennett was that he didn’t respect the run enough. 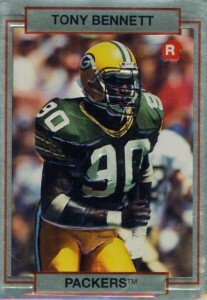 After a slow 1990, Tony would take off, sacking opposing quarterbacks 13 times in 1991 and 13.5 times in 1992. After a 102 day holdout in 1993, Tony would make 6.5 sacks- he’d leave via free agency to the Indianapolis Colts in 1994 and record 28.5 sacks over the next 4 seasons for them retiring after an injury plagued 1997. All in all a respectable career for 8 seasons logged. 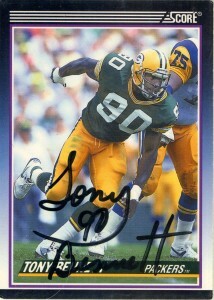 I got these two cards autographed by Tony after I had really good results mailing the Packers back in the early 90s for players like Darrell Thompson, Brett Favre, Reggie White, and Sterling Sharpe.